I love the story St. Luke tells in chapter 5 of his Gospel. Jesus, uninvited though He was, gets into Peter’s boat. 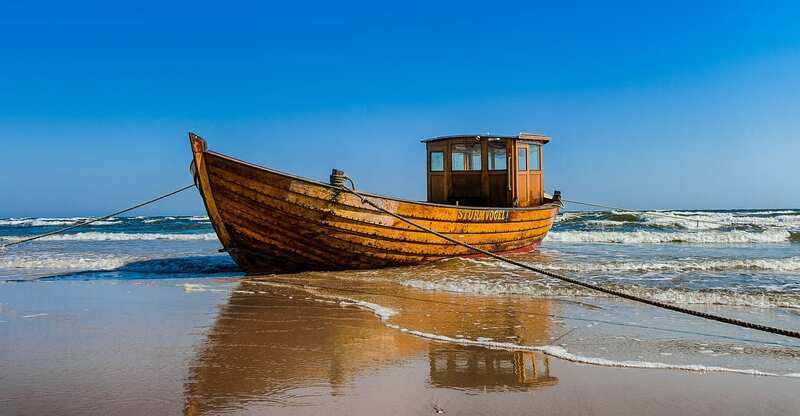 He tells Peter to “put out into the deep and let down your nets for a catch.” Now Peter had been fishing all night without much success and was washing his nets. I wonder what he thought of Jesus asking him to do this. After all, Peter was a professional fisherman; he knew the waters well. But Peter did as Jesus asked, putting out into the deep water, and the catch was so great his nets began to break. He had to call for the help of his partners in another boat. Jesus was calling Peter to step out into something new, into the deep water. He would now become a fisher of men. You might be wondering what this has to do with my journey, so I’ll try to explain. You see, Jesus got into my boat, metaphorically speaking, and called me out into the deep waters of the Tiber. Mind you, I did not ask for this “intrusion,” this calling me away from the shallow waters where I could see to plant my feet. I was comfortable where I was and doing good work, I thought. I do not like deep water, in which I can’t see where to safely plant my feet. But Jesus was going to infuse the grace to move me away from my comfortable, familiar moorings. I was raised in a devout Christian home with loving parents who taught me to love Jesus. My Dad was a Baptist minister in a small town in West Virginia. Everything was familiar and comfortable. Church was our life, and we loved it. I don’t recall ever not wanting to go to church, even as a teen. I don’t recall ever having not felt that Jesus was there with me, in me. However, in our Baptist tradition, we were taught that, in order to be saved, we must go forward in church to the altar and pray. Then we were to make our confession, that we had surrendered our hearts to Jesus. Then we would be baptized, to follow the example of Jesus. The day before my 14th birthday was Sunday, and we were having a revival meeting. I had determined before I went to the Sunday service that I would go to the altar and pray and make my confession. I assumed that, by doing this, I would somehow feel differently. That’s what people always would say about their confession. I prayed and prayed, but nothing like that happened in my heart. I could not make a confession, since I assumed that whatever was supposed to happen had not happened. I must be holding something back from surrender to God, I thought. I prayed and reflected on this all week. Finally, on Friday, God, in His mercy, revealed to me that I already had the grace of the salvation I was seeking. I talked to my Dad, and that night, at church, I made my confession of faith. Two weeks later, I was baptized. Throughout my school years, and into my married life, I continued to attend church faithfully and serve in many capacities. Wherever we lived, I always found a church and got plugged in. After my children were born, they were always taken to church. We had the wonderful blessing of seeing them saved and baptized. Though I was not always obedient to the Word of God nor a faithful witness, I never stopped attending church. When I was in my early thirties, I attended a retreat, where I received a profound calling from the Lord to study the Scriptures. I made a commitment to do this. I began getting up thirty minutes before my family started their day. After a while, I had to start an hour earlier. That has become my lifelong practice, a calling for which I am grateful. The Lord poured into my heart all that I would so desperately need in the coming years. Those were very troubling and hard times in the life of my family. At the age of thirty, my husband was diagnosed with rheumatoid arthritis, and his years were filled with pain and frustration, affecting the entire family. He later had heart problems, and then cancer. He died at the age of 53. During those years, at the age of forty one, I myself contracted cancer and underwent treatment. God has graciously kept me cancer-free from that time. I also lost both my parents. Life always has its many challenges, but I found that God is never far from me and has used every hardship for a greater good. God has used that long-term calling by having me study the Bible and has blessed me to be able to teach others. I have always had a passion for helping people to grow in their faith. That growth comes about through our truly knowing the object of our faith — God. We can’t love and trust someone whom we do not know. I want to help people realize that to see and know Jesus is to see and know God the Father (John 8:19). My pastor asked me to help him and our shepherds to plant a church on our university campus. Again, I felt that calling to step out of my comfort zone into the deep. After all, I was many years removed from college life. What would I have to offer these students? Oh, the grace of God is truly amazing! He helped me develop a relationship with these young people and to help them grow in their faith. They lovingly responded to me. I think they looked to me as their grandparent. That was quite all right with me. It was four years of tremendous blessings. I had settled into that life of service, but I guess God didn’t want me to become too settled, because I started feeling as if I didn’t belong there any longer. I talked with my pastor, and he advised me to go back to our main church. He had a Sunday school class he wanted me to teach. So I did that and also started going to a Wednesday night small group. The latter were doing a DVD series on heaven. I encountered there some questions about the Catholic Church — actually what they thought the Catholic Church taught. This happened on a number of occasions. I was quite sure the things I heard were not the true teachings, but could not counter them with the truth. Growing up, I had not been taught anything about the Catholic Church and didn’t know of any Catholics in our area. That did not happen until I moved to a larger city, where I actually had Catholic friends in my workplace. In that city, I encountered people who were anti-Catholic, even in the church I attended. But my son married a wonderful Catholic girl, and he converted 18 years ago. His children are members of a Catholic parish, and they faithfully attend Mass. I had gone with them several times on special occasions for the children and holidays. I often wondered why I did not feel a calling to be there with my family. So I knew from my times at Mass that I was right to be skeptical of the things that I heard in that small group. I hate not knowing the truth, especially the truth of something so important as the beliefs of other Christians. I started searching the internet for the answers. That searching became the catalyst for my Baptist undoing. One thing I had never questioned was when the Baptist Church started. I didn’t know the history of my own denomination. It never seemed there was any reason to question it until now. What was Christianity before the Baptist Church was started? Suddenly, I realized I was missing sixteen hundred years of Church history. I had to find out why and what happened. Of course, I knew about Martin Luther and the Reformation, but I didn’t think it relevant to me. But I wanted to know about the Catholic Church and the teachings that we were protesting in our Protestant faith. I found the Catholic Answers site and started there with questions. At first, I wasn’t even sure what questions to ask, so I started with the first one raised in the small group: Why baptize infants? I had attended the infant baptisms of my grandchildren and I felt I understood the concept. Actually, for many years I had questioned the Baptist teaching in light of the writings of Peter and Paul that Baptism was for the forgiveness of sin (Romans 6:3–7; Colossians 2:11–14; 1 Peter 3:21). The reasoning for infant baptism made sense to me, since we are all born with Original Sin. In the quest for an answer to any question, I was always led to more questions and more searching. The thing that impacted me most was learning the Catholic Church’s teaching on the Eucharist. As Baptists, we celebrated communion once a month, and it was just a symbol to remember Christ’s death. I felt there must be more. I had never heard a viable explanation of John chapter 6. I had never heard how to interpret what Christ instituted at the Last Supper. When I read how the Catholic Church regards the Eucharist as the real Body, Blood, Soul, and Divinity of Christ under the appearance of bread and wine, I was overwhelmed and overcome with emotion. For I knew this was the “more” I had been wanting. In fact, I knew that, if this was really true, nothing could keep me out of the Catholic Church. There was, however, much more that I needed to find out. I kept hearing about the Church Fathers, and I wanted to know what they had to say about the early Church. I ordered books, and more books, and pored over them for months. I also discovered Scott Hahn and Marcus Grodi and read their books. Everything I was encountering in regard to Catholic teachings made so much sense. The question of biblical interpretation was always somewhat baffling to me, because all the Protestant denominations seemed to have differing ideas about the meaning of a given passage. It had not occurred to me that there was somewhere an authority over biblical interpretation. I’m thankful those books pointed out that fact. 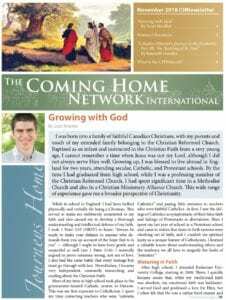 I found the wonderful world of the “Deep In History” conferences hosted by the Coming Home Network International. I listened again and again to the speakers and was totally amazed at what I was hearing. Of greatest significance to me was the talk by Rod Bennett and his discovery of the Catholic Faith. The book he wrote, called Four Witnesses, was a real turning point for me. From that, I learned of the Didache and then read. I watched every episode of The Journey Home television program, with each one something new and wonderful. I watched EWTN and became more and more familiar with Catholic life. I was now at a crossroads and faced with a great dilemma. I was fairly certain that the Catholic Church was the Church founded by Jesus upon Peter and the Apostles. I believed the Church’s teachings and was confident of their truth. But what was I supposed to do about it? I started going to morning Mass and praying for discernment and guidance. That was an amazing discovery in itself, because I knew Jesus was truly there. Up to this point, I had not spoken to anyone about what I was doing. I didn’t want to be questioned in a way that might discourage me. I continued to attend the Baptist church, but more and more did not even enjoy going. I considered it rather pointless, and I felt bad for feeling that way. I even started leaving after my Sunday school class and driving to the Catholic parish to attend Mass. I decided I had to tell my Baptist pastor the situation. We had a long discussion. He was very gracious to me but handed me a book to read. I accepted it and started reading. Something in it didn’t correspond to what I had already learned. I checked, then, to see who this person was that wrote it and found that the book was written by a Protestant. I had already heard their objections and worked through them. I resigned my Sunday school class and quit attending the Baptist church. I had made many wonderful, close friends there in twenty five years, and it was difficult leaving them. My special group of five women remains close to me, and they accept my decision. However, one very special long-time minister friend and his wife have totally rejected me. That was very hurtful, and I grieve the loss of their friendship. It was August of 2015. I was still reading, listening and watching to learn more and more. It was nearly a year now since my journey of faith had begun. I wanted more than anything to join this wonderful Catholic Church and be able to receive Jesus in the Eucharist. I knew RCIA classes would be starting soon. But I wondered how I would be able to wait all those months before I could formally be accepted, in order to receive Jesus in the Eucharist. I met with the priest at the parish I had been attending. To my great delight, he said he would meet with me weekly. He said he could see that I had already learned what RCIA would teach me. During those times, he instructed me and answered all my questions. I had already been validly baptized. We agreed on a date for me to be confirmed in the Catholic Church. That week, I went to Confession, which was something I was dreading. It had been many, many years since my baptism. It is one thing to confess to Jesus, but quite another to confess my sins to a priest. But the priest explained to me that, when he hears confession and pronounces absolution, it is not he but Jesus who is hearing and absolving. He was very patient with me. I was confirmed in the Catholic Church on September 25, 2015 and received Jesus in the Eucharist at the age of 67. This has been the greatest blessing of my life, and I thank God every day for making me Catholic. I love the Catholic Church, even with her flaws and sinful people. There is nowhere else in this world where we can go and be fully in the presence of almighty God and receive Him sacramentally. I wish everyone could know the truth and beauty of His Church. I have made wonderful new friends in my parish. I teach a women’s Bible study. I teach them more of the Scriptures, and they teach me more of the Catholic Faith. I’m thankful that I now have the guidance of good apologists, who have the guidance of the Church for interpretation of the Scriptures. I’m forever thankful that God called me to put out into the deep water. He lavished His grace upon me, calling me into this precious life of faith. I no longer fear the deep waters, because that’s where Jesus is. And perhaps He will grant me a catch. Barbara Vance lives in Huntington, WV. She is a widow since 2001 and actively attends St. Joseph Catholic Church, where she leads a women’s Bible study. She has two children and five grandchildren and works part time in her family business.